Ideal for curved, lightly textured / corrugated or flexible loads. For loads with various stacked heights or uneven surfaces. Not for vertical loads. Built-in Aluminum Backing Plate allows you to screw into the cup without a secondary fitting. 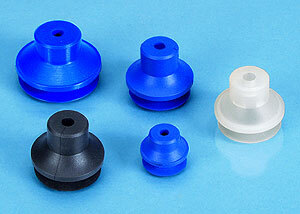 These 1.5 Bellows Vacuum Suction Cups attach gently and easily with minimum pressure. Excellent for most concave and convex shapes, bellows suction cups attach to curvatures such as containers, cylinders, etc., and can be used in any orientation. The spring action compensates for height variances in the load or machine inaccuracies. 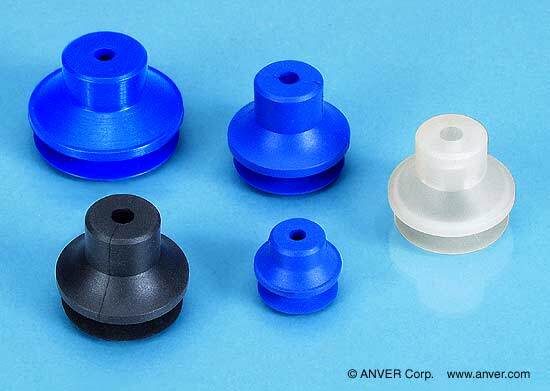 The bellows suction cup design duplicates the function of mechanical spring and ball-joint connectors in a much smaller and more economical package. The cup has an internal aluminum mounting plate and a single G 1/4″ Thread. (This is basically a straight 1/4″ pipe thread.) We also offer these with a 1/4″ NPT thread for a nominal additional charge. This cup’s dimensions are similar to a number of other cups in this size range, making it well worth your consideration.